Painted Plastic Printed People in 3D! This morning, instead of doing more printer tests, I smeared some bronze metallic acrylic paint over the calibration cube from the night before, so I could see the surface texture better. That showed up some under-extrusion in the top layers. Hmm. I’ve never painted one of my 3D prints before, for some reason. Maybe because I’ve been feeling that it would be ‘cheating’ to do post-processing on the prints. Somehow I was set on the idea that the output of the printer should be the final object, perfect in every way. Which is silly. And typical of the untested assumptions and self-imposed ‘rules’ I seem to pick up without noticing. Since the world didn’t end when I dared to put paint on my little piece of home-made plastic, I decided to really ‘push the envelope’. I grabbed a plastic bottle of black student-grade acrylic. Turns out that it has been sitting on my shelf for so long the pigment had separated from the clear binder medium. Never mind. Vigorous shaking of bottle ensues. I pour some out into a small bowl and stir the binder and pigment back together. Next thing I grab is two human science fiction figures, Prance Vichard and Space Girl, both created by dutchmogul (aka Arian Croft). He designed them as part of a printable science fiction miniatures game, where they were supposed to be 28mm high. That’s the standard size for most metal miniatures used for tabletop roleplaying games and some wargames. My printer doesn’t have the resolution to make a human look good at that size. And my eyesight and shaky hands couldn’t paint them that small anyway. That’s why I don’t collect those metal miniatures anymore. So I scaled the STL models up in size to where they were more like 140mm tall, like some ‘action figures’ and fan collectibles. That’s a major advantage of a 3D printer right there: rescalable toys. dutchmogul provided the figures in two parts, sliced down the vertical plane between front and back, so you print them horizontally. That gets around the problem of unsupported overhangs like chins. They printed fine. I glued the parts together with some superglue. (I wonder whether acrylic medium would be strong enough, since I know that mixed-media artists sometimes build assemblage art using acrylic medium in place of glue.) Then I put them in a drawer and forgot about them for months. They still seem to be thoroughly glued together, so the glue worked. I used a cheap, stiff long-bristled paintbrush to apply the black acrylic, scuffing it into the nooks and crannies. The characteristic surface texture of the layers is really obvious under the brush, and working with the layers instead of across them seems to work best for smoothing the coverage out. While the paint was wet it wicked itself into an effect that looked like a wash – where the pigment collects in the crevices and cracks as if deepening the shadows, leaving the high bits as pale highlights. Once it dried, that effect disappeared and the paint finish looked much better than I expected. 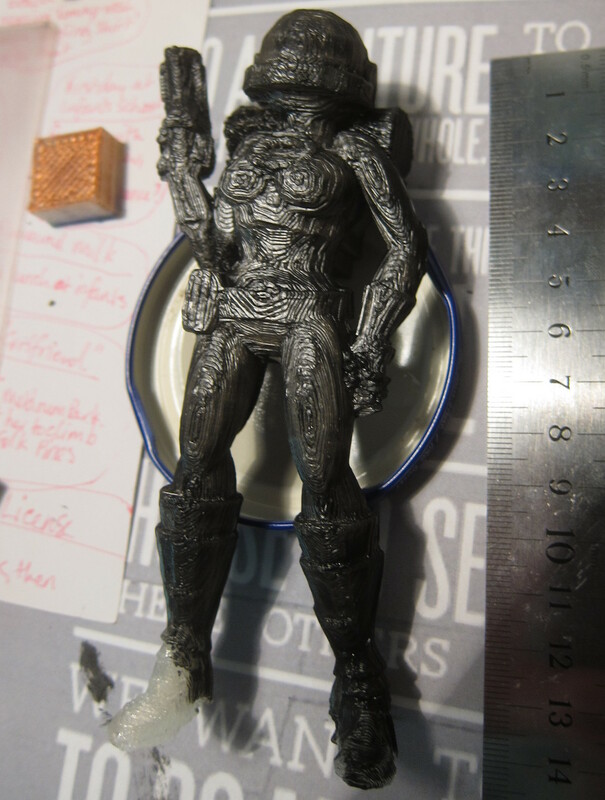 The thin coat of paint makes it much easier to see the surface detail than the translucence of unpainted clear PLA . The satin finish adds some sheen without looking like those old Britains glossy toy soldiers. I think I could really start to like the layered nature of the prints. Very Mechanistic. We’ll see how it works when I try to put some coloured detail over the top.